“It’s the intersection of art, science, and technology that makes holography so interesting,” stated Stephen Benton (1941-2003), a key figure in the development of modern holography not only on account of his scientific achievements (such as the holograms on credit cards) but also for his artistic talent. The fact is that in addition to innumerable scientific and technological applications, holography is one of the few scientific fields that have provided a medium for art. Stephen Benton first saw a hologram in 1964 and some years later he remembered that it was the most amazing thing he had ever seen. Views from different angles of the image reconstructed by a hologram, showing changes in perspective. Deutsches Museum (Munich). Credits: Augusto Beléndez. In simple terms, we can say that holography enables three-dimensional images to be produced and involves two stages: recording and reconstruction. Furthermore, the physical principles of holography are based on the wave-nature of light: the phenomenon of interference in the recording stage and diffraction during reconstruction. In the recording step the interference pattern formed between a wave from an object illuminated by laser light and a reference wave from the same laser is stored in a recording medium. The printed recording medium, after developing if necessary, is what constitutes a hologram, a term coined from the Greek “holos” meaning “whole”. In the reconstruction phase the hologram is illuminated by a laser to obtain a virtual image and a real image of the object. In this way, if we look through the hologram we will see a three-dimensional image of the object. This type of hologram is called a transmission hologram while another type known as a reflection hologram may be reconstructed using white light. A fundamental difference between photography and holography is that in the latter instead of storing a two-dimensional image of an object formed by a lens or system of lenses, sufficient information is stored to allow the object wave itself to be reconstructed. It may be said that holography makes it possible to “freeze” the object wave and subsequently “set it in motion again”. Consequently, the three-dimensional character of an object is maintained. It is possible to move your eye around the reconstructed image of the original object and see behind it, making the parallax effect obvious. Holography was invented in 1947 by Dennis Gabor (1900-1979), a Hungarian engineer living in England, who received the 1971 Nobel Prize in Physics for his work. However, Gabor’s idea would have been no more than a “white elephant”, useless and superfluous, if two new scientists had not appeared on the scene: Yuri Denisyuk (1927-2006) in the old Soviet Union and, in particular, Emmett Leith (1927-2005) in the United States. In addition, thanks to the laser invented in 1960 by Theodore Maiman (1927-2007) light with the coherence necessary to record high quality holograms became available, thereby opening the door to numerous applications. In 1964, Leith and Upatnieks at Michigan University made the first hologram of a three-dimensional object –a small toy train– using a laser and the new “off-axis” holographic technique they had invented. Combining laser light with this “off-axis” technique enabled holography to enter the real world of three-dimensional objects. 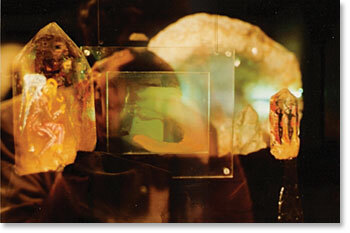 For almost two decades, from 1947 to 1964, holography had been a collage constructed from different perspectives. The exciting vision in April 1964 of Leith and Upatnieks’s three-dimensional hologram gave a new lease of life to holography. Thanks to this little toy train, hundreds of researchers began to study these techniques and in the following years over a thousand scientific articles on hologram recording were published. In 1966 Leith and Upatnieks made a hologram in collaboration with the photographer and artist Fritz Goro (1901-1968) for the journal Life and in 1968 the article “Holography: A New Scientific Technique of Possible Use to Artists” was published in the journal Leonardo. This article discussed the possibility of using holography as a new form of art and a number of artists began to experiment in this field. One of the most important was the British artist Margaret Benyon who made her first holograms that same year. 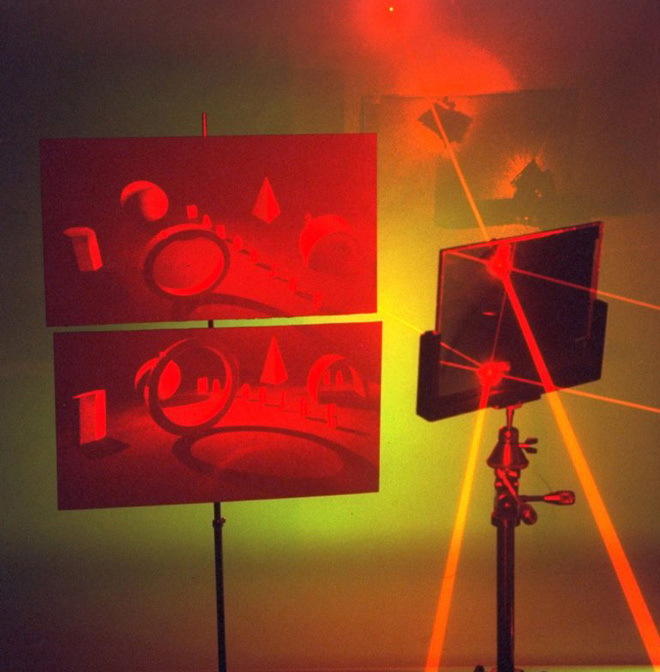 Also in 1968 the first exhibition of artistic holography was held in Michigan –the world centre of holography at that time- and the second in New York in 1970. In 1971 a school of holography opened in San Francisco, where scientists, engineers and artists could learn this new technique. Holography thus became an unusual example of a scientific field in whose development groups of people from very different walks of life participated. Anybody who has seen a hologram will agree that holography is one of the most interesting revolutionary techniques for creating three-dimensional images and its capacity to fascinate is unquestionable. As opposed to the static, constant nature of paintings or photography, holography implies movement of the observer and variation of the image since different angles of vision are produced during the dynamic perception of a holographic image. Between 2004 and 2005 the Japanese artist Hiro Yamagata exhibited his work entitled “Quantum Field-X3” outside the Guggenheim Museum in Bilbao (Spain). It consisted of two cube-like structures covered in holographic panels the colour of which changed depending on the direction and angle at which the sun’s rays impinged on them and the position of the observer. Quantum Field-X3 installation project at the Guggenheim Museum in Bilbao by Hiro Yamagata (2004-2005). Credit: Guggenheim Bilbao Museoa © FMGB Guggenheim Bilbao Museoa / Erika Barahona Ede. 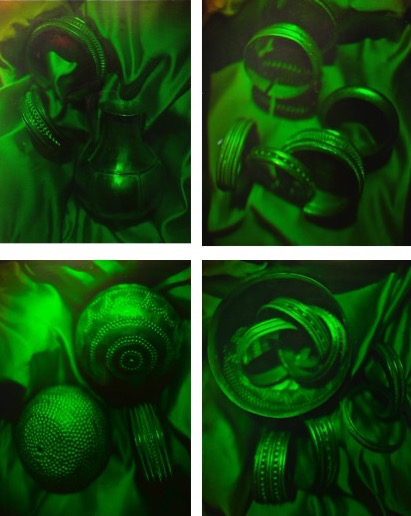 Holography is also used in museums to substitute certain delicate valuable objects with holograms or in travelling exhibitions to substitute the original objects with holograms. 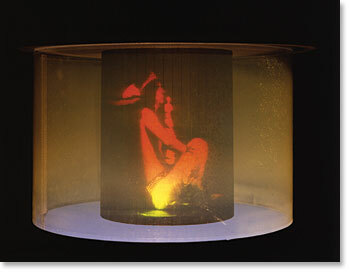 For instance, in 1984 at the University of Alicante (Spain) a series of reflection holograms of the treasure of Villena were made. Holograms of this type have been used in various countries within the framework of a vast programme of collaboration between physicists and museologists to preserve works of art considered archaeological treasures. The fidelity of reproduction of shapes, colours and brightness is so spectacular that it is difficult to tell whether we are looking at the object itself behind a glass window or at a holographic reproduction. Salvador Dalí (1904-1989), surrealist artist and eccentric genius, also dappled in holography as a medium for his art. 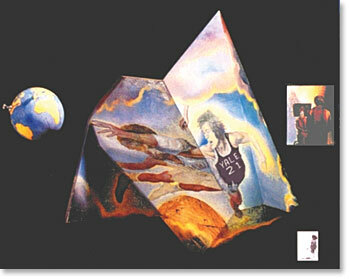 Between 1971 and 1976 Salvador Dalí and the South-African artist Selwyn Lyssack collaborated to produce seven holograms entitled “Brain of Alice Cooper”, “Crystal Grotto”, “Dali Painting Gala”, “Holos! Holos! Velázquez! Gabor!”, “Submarine Fisherman”, “Polyhedron”, and “Melting Clock”. The artists received technical assistance from Conductron Engineers to produce holograms with pulsed laser and the Multiplex Company to make holographic stereograms. 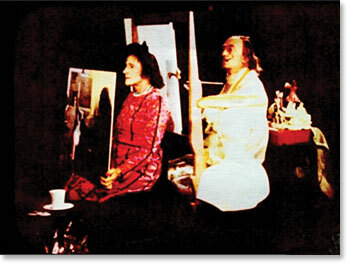 Dalí exhibited his holograms in the Knoedler Gallery in New York in 1972 and 1973 and Gabor himself attended. One of the holograms made in 1973 was entitled “Brain of Alice Cooper” and was a holographic stereogram of Alice Cooper, hard rock and heavy metal singer, a true rock icon, born in 1948. 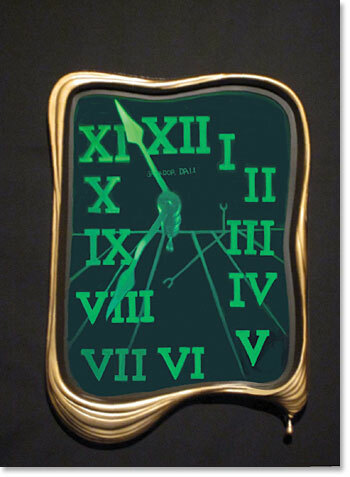 Another of the holograms conceived by Dalí in 1975 entitled “Melting clock” was not actually made until 2003 when Selwyn Lyssack did so from Dalí’s original sketch. Both Dali’s sketch and the hologram were auctioned last year at Sotheby’s. The auction estimate for the lot was between 100,000 and 150,000 dollars. In fact it was sold for 269,000 dollars. 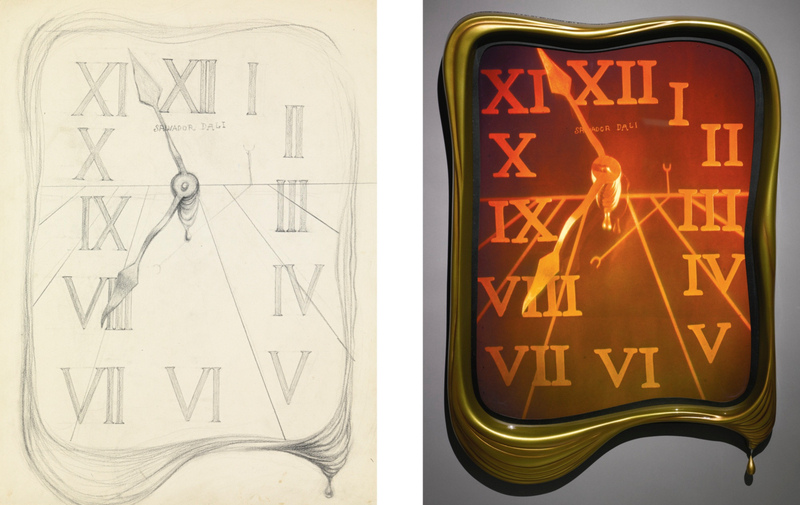 “Melting clock”: Dalí`s sketch (1975) and hologram made by Selwyn Lyssack in 2003, auctioned in 2014. Credit: Sotheby’s. The Swedish painter and sculptor Carl Fredrik Reuterswärd (1934-) is another established artist attracted by lasers and holography. He began to study the possibilities of holography as an art form in 1969 and received technical assistance from scientists at the University of Uppsala, Sweden, and the Royal Institute of Technology (RIT) in Stockholm, Sweden, such as Hans Bjelkhagen. Like Dalí, Reuterswärd also created various truly unique pieces of holographic art. Kilroy was this artist’s main work over a period of 10 years and is made up of various individual pieces such as “The Hand”, “The Seal”, “The Dog’s Bone” or “The Heart”. 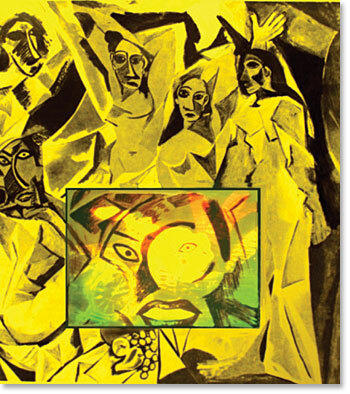 Another example is a reflection hologram entitled “Cross Reference” in which Reuterswärd poses as none other than Dalí himself. What better way to end this brief review of the relationship between holography and art than to do so as we began with the words of Stephen Benton. He stated that creativity does not belong exclusively to the domain of art, it is present in all areas of our existence and one of the most interesting aspects of holography is the symbiotic relationship that exists between science and art. Sean F. Johnston, “From white elephant to Nobel Prize: Dennis Gabor’s wavefront reconstruction,” Historical Studies in Physical and Biological Sciences, Vol. 36, No. 1, September 2005 (pp. 35-70). Augusto Beléndez, Holografía: ciencia, arte y tecnología (Inaugural Lecture, University of Alicante, September 2007). 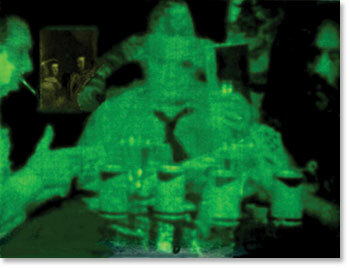 “Emmett Leith (1927 – 2005) Inventor of Practical Holography,” The University of Michigan EECS News, Spring/Summer 2006. 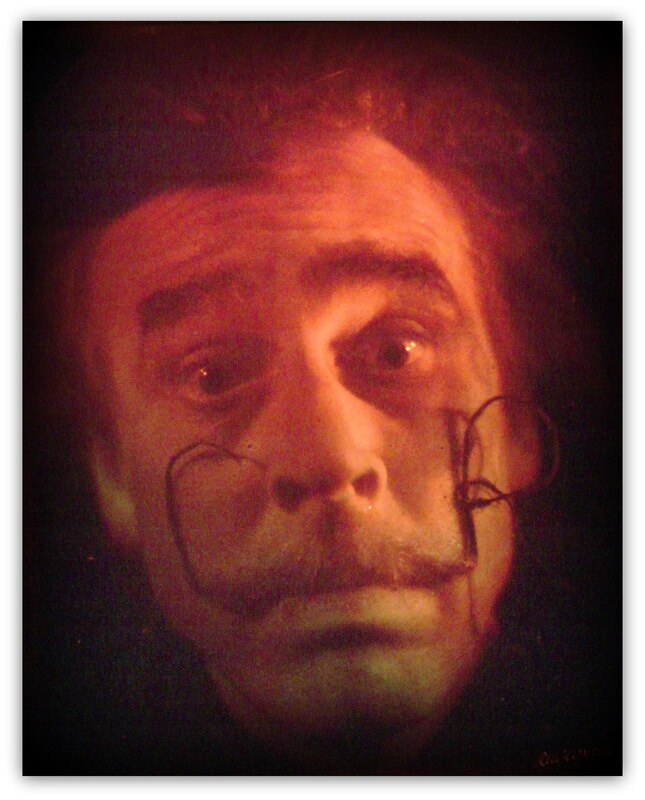 Selwyn Lissack, “Dalí in holographic space: A collaboration of art and science,” SPIE Professional January 2014. Hans I. Bjelkhagen, “The early art holograms of Carl Fredrik Reuterswärd,” SPIE Professional, July 2014. 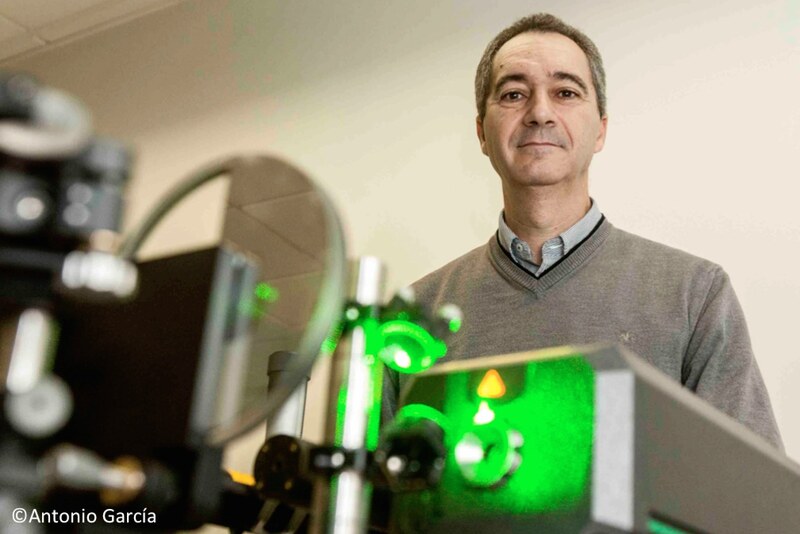 Augusto Beléndez is Full Professor of Applied Physics, leader of the Group of Holography and Optical Processing and Director of the University Institute of Physics Applied to Sciences and Technologies at the University of Alicante of Spain. He is mainly interested in holography, holographic recording materials, holographic optical elements, optical storage, and the teaching of physics and engineering. He is a member of the Spanish Optical Society (SEDOPTICA), Royal Spanish Society of Physics (RSEF), and European Optical Society (EOS). He is Senior Member of the International Society for Optics and Photonics (SPIE) and the Optical Society of America (OSA). He is active in public outreach: he has published numerous articles in popular science journals, and in the media. In 2009 he started the blog “Física para tod@s”, and he have given some talks to general public on science.